I would love to know your guys' thoughts on the wedge sneaker trend! It's so funny because I bought a pair of wedge sneakers from Steve Madden about 5-6 years ago and loved them at the time but I really haven't continued wearing them much throughout the years. So I actually like these new ones that are out, they aren't quite as obvious as mine were- The wedge is hidden so you can't really tell by quickly looking that they have a heel. I will most likely resist succumbing to this trend and buying a pair because I think its just that, a trend, that will fade eventually. But it seems like the more you see something in magazines, on the streets, on TV, the more you like it, so who knows! 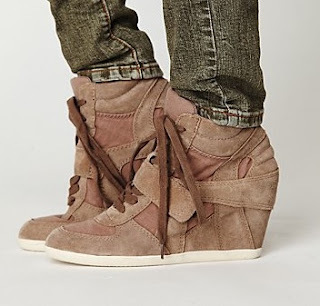 Would you buy wedge sneakers?!! !